At the start of your turn, summon a random creature from your deck to a random lane. 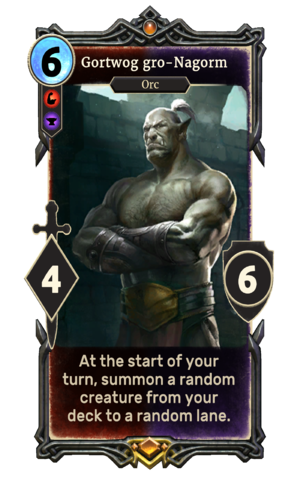 Gortwog gro-Nagorm is a unique legendary Warrior creature card. It is part of the Core Set. "Now, see how an Orc lord fights!" "For the glory of the Orsimer!" Gortwog first appeared in Daggerfall. For more information, see the lore article. Using Gortwog gro-Nagorm contributes towards "The King of Orsinium" title. This page was last modified on 25 February 2019, at 01:16.